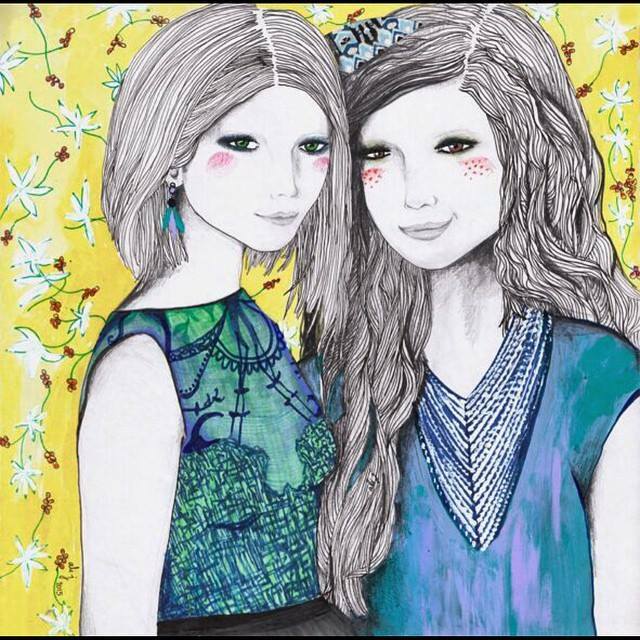 A lovely fresh design by Ali J expressing friendship, youth, beauty and joy. As I meandered around the various stalls at the last Angove street Festival, I came across a wonderful, creative and colourful stall display which immediately caught my attention. I was drawn to Ali J’s designs for their simplicity, for her fresh colourful designs, and I loved the way she painted onto recycled printed text, I loved this re-use concept. I made a purchase and had a chat, and soon I was even more engaged. I was so impressed by Ali’s self sufficiency, she literally designed, created and produced everything herself. Her creative independence and efficiency was impressive and inspiring for me; so much so that I wanted to interview her and feature her on my blog. So here goes. I hope these answers serve to inspire you too, and ideally provide fuel for your own creative projects. Please tell me about your business and about your range of art? What products do you have? I’m an artist and an illustrator who paints, draws and sews. My work is bright, young, detailed, multi layered and figurative. I started seven years ago painting portraits but have since extended to painting animals, objects and landscapes. All of my work revolves around varying themes of empowerment, childhood, belonging, growing up, memories, simplicity of life and communication. My primary technique is to collage vintage book pages onto canvas and then paint people/objects on top of the text. Often my work is painted over old paintings, or I use words or books that have a certain connection to the process at the time. I am lucky that all of my work has developed a style of its own and is instantly recognisable as my own. As part of my arts practice an aim for the everyday person to be able to enjoy and afford my works I turn them into prints, pencil cases, pillows and varying objects such as necklaces, badges and pocket mirrors. I make everything by hand in my studio – I sew the pillowcases, I insert the zips, I even create the fabric repeats on my computer. All prints are printed by hand by me with a specialist archival printer with top quality inks. My art is much more then paint on a canvas. 2. What inspires you the most with your artwork? Creating my art allows me to speak to my inner voice and express emotion. It allows me to put a voice to the feelings, the thoughts and the ideas that pop into our minds but not necessarily have someone to express it to. My art is my salvation, it is what keeps me sane, keeps me motivated and makes me strive to keep reaching higher. I love to create the work but I also love to see how others interact with the art and what meanings they read into it or what they see. No one ever sees my art the same way that I do, and I insert a lot of secrets into the work to add depth and layers. I am inspired by the way my art challenges me to keep experimenting, creating and working out how to express myself in a different way each time. 3. What advice can you offer to other burgeoning artists? Experiment, experiment, experiment!! I see so many emerging artists trying to create perfect work, replicate other artists work or generally not knowing how/where to start and just dreaming of what they could do. Pick up some materials, and a surface to create on, and let yourself express in whatever means feels comfortable. It might be drawing on canvas, painting on paper, stitching shapes or spray painting a wall or moulding clay. Join in an art class, go to a life drawing class, sit down with some friends and just create. For every great work I make, I have a pile of works that I’ve started that I will never finish or piles of experiments. Some of my greatest works I’ve despised until I’ve had a break from them – sometimes months just because of the intensity it took to create. Each time I explore materials, express emotion or just engage in art making I learn something new and find a direction to follow. An awesome illustration with green features, to be honest this picture reminds me of my Mum, who loved green so much. 4. Please tell me more about yourself. What does your day to day look like? I’m a Mum of two young girls (two and five) with another child on its way. My day is all about juggling chores, kids, time management and making time to enjoy my family. Generally I get up, do chores/breakfast/school run. When I get home I get a couple of hours work in, rotate chores in my breaks and then scoot back to school in the afternoon for school pickup. The kids come home with me and we might do some art making together, then its dinner and I try not to do anything at night time unless I have urgent deadlines to fulfil. As most of my clients are interstate or overseas it is very common for them to receive their final files in the early hours of the morning so I can meet their deadlines with the time difference and get a bit of a sleep in. I have my youngest in daycare for two days a week so she can interact with other kids her age – she’s super smart and loves learning. Those two days are when I try to speed through as much work as possible. 5. Can you describe yourself in 5 theme words with a little description? Hard working, motivated, high expectations, friendly, always helping others. I have always strived to work hard and I am very critical of myself in all aspects. I love to surround myself with my friends and I am always the first you can call when you need a hand. 6. What are three goals you are working on towards your art business? With another baby on the way, and waiting for my new studio to be built; I am changing the way my business is operating so I can still actively create and not go into hibernation. My main aim is to change my business to focus on increasing my client base and ability to fill a wider range of briefs – so extending my art to appear in more magazines / on a bigger variety of products / image licensing. This way I can create the art and someone else is responsible for marketing it and reproducing it onto items. My second goal is to build my dream studio which we are finalising plans for now. My third goal is to be signed with an illustration agency. I’ve been on the cusp for a number of years and I am being watched by a number of amazing agencies but need to prove I can fulfil a bigger variety of briefs before they sign me. A goal I can’t wait to achieve! The day I met Ali and viewed her store at this local street market, I was immediately impressed with her ability to be so ingenious, so self sufficient, and be such an inspiring creator. I loved her simple but detailed and colourful designs, and I continue to be in awe of her ability to keep pumping out creative designs and projects. Having a family, being pregnant and having other life demands like moving house appears to be no hindrance or excuse, instead she takes it all on as a challenge and just plows forward determinedly. Now that is impressive and inspiring! 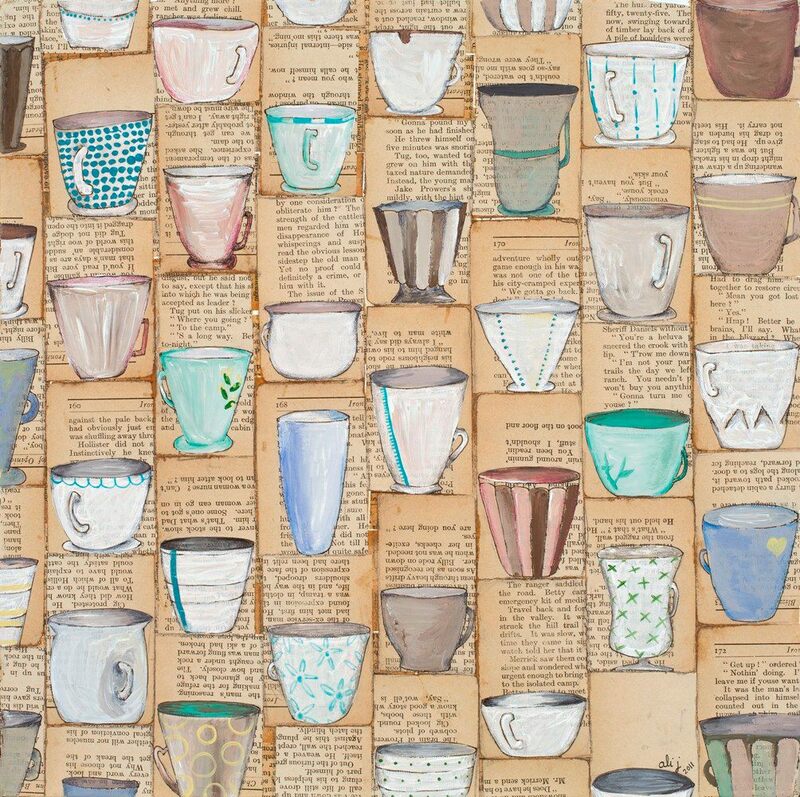 I really love this illustration of tea cups. Such lovely work Ali J well done!! 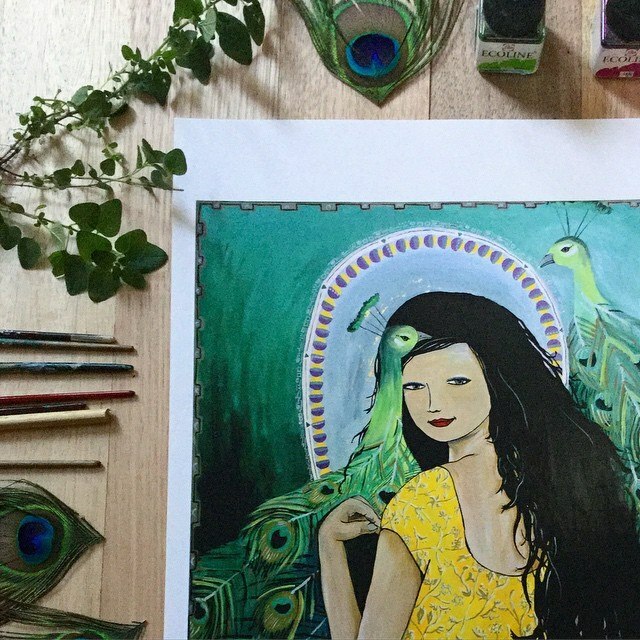 You can find Ali J’s website here for more information and to support her as an artist why not buy one of her prints or products? They really are fabulous, and I wish her all the best in achieving her goals in the near future. I have no doubt she will continue to be a high achiever! Also check her out on Instagram to follow her and see more of her current and future impressive designs. Thanks Ali for being a part of my blog, I hope that my writing and photography can be of some source of inspiration for you too! Wishing you all the best in your creative pursuits! ← A Very Thoughtful Heirloom.